Scott Wren and Marlin Thompson with the La. Amateur Radio Relay League were guests at the February 911 Commission meeting. The group of all volunteer ham operators assist first responders during emergency situations. “They are beneficial when we lose communications, which doesn’t happen as much now as it used to, but they are on standby and can communicate statewide on very little power,” said Director Willis Carter. Thompson said the operators could help coordinate staging areas for water, blood, Red Cross and other resources as needed. “We are here simply to establish a relationship,” Thompson said. “We have the equipment and procedures in place if and when needed.” The La. 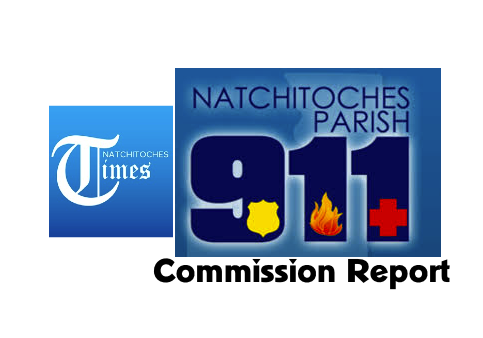 AARL group requested a space in the new 911 Natchitoches Communications Center (NATCOM) to set up a base. Carter said this request is not uncommon. The communications district set new hours for address applications. “The new schedule is Tuesday and Thursday from 8:30-11:30 a.m. This gives us the ability to schedule. If anyone needs to meet other than these times, just call and we’ll set it up,” Carter said. The number is 357-8300. A resolution to establish a Joint Operations Executive Management Committee that was tabled in January for additional verbage to be added was reintroduced. The verbage establishes it as a standing, not temporary committee. Members will include Director Willis Carter, Ambulance Director Larry Atteridge, Fire Chief John Wynn, Police Chief Micky Dove and Sheriff Victor Jones. Members will change as needed. The committee’s decisions will be brought before the entire board for discussion and/or vote. Commissioner Chris Paige asked if the committee was being established for a “particular purpose.” Carter said the purpose was to establish policies and procedures from the standpoint of first responders. “These are the ones who are responsible for operating the *PSAP. They’re the stakeholders. It’s where the rubber meets the road.” Paige cast the only nay vote to establish the committee. Architect George Minturn said the masonry is nearing completion at the NATCOM center. The building is not yet enclosed due to delays by the glass company, a subcontractor which falls under the contractor’s umbrella of management. The contractor must ensure the subcontractors comply with their contract. Minturn said the roof is “primarily complete” and the water and drain systems were being tested. Completion is tentatively scheduled for April. •PSAP-A public-safety answering point, sometimes called “public-safety access point”, is a call center responsible for answering calls to an emergency telephone number for police, firefighting, and ambulance services.